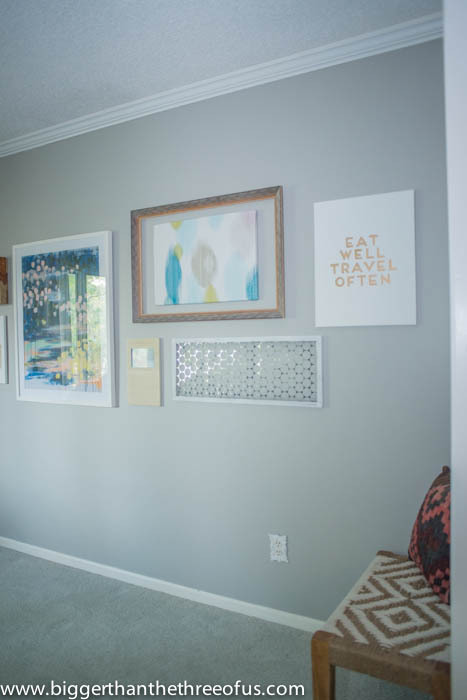 So, I told myself the living room wasn’t getting a gallery wall and it didn’t… for 2 years. But then, I got so tired of looking at the large looming BLANK wall that I decided to just give in. I told Luke it was only temporarily going to be up there, because eventually I would find the perfect wall treatment for that wall. Well, now that I have it up and it’s been up for a month or so… I totally love it and couldn’t imagine anything else there. Are you laughing at me yet? LOL. Ok, I’ll take you down memory lane just a bit before I show you the wall. 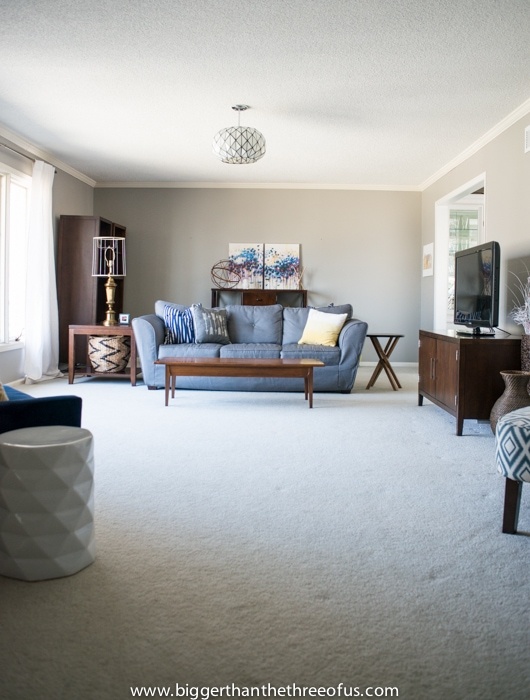 The living room looked like this from Jan-July of this year. 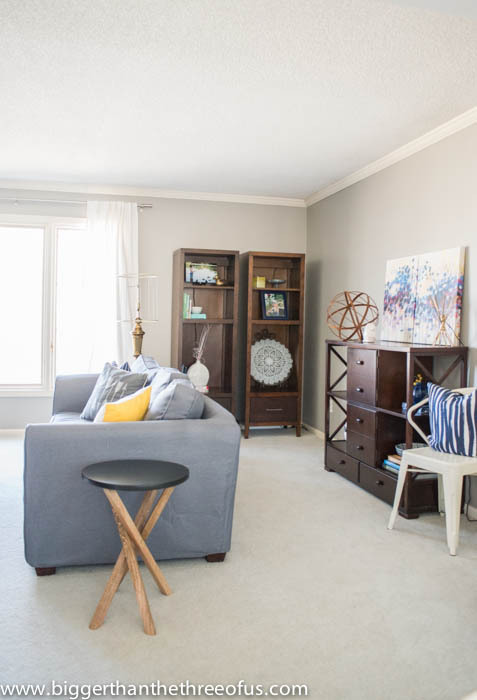 Not terrible, but not homey and just a mix-match of stuff everywhere. We did a few switheroos early this summer to make it feel like us. We moved the cabinet from behind the couch and relocated that downstairs. I liked having the cabinet back behind the couch from the side view, but from head-on I hated how it looked. So, it’s been blank behind the couch for quite some time. We also removed that media cabinet (in person it stuck out too far) and in it’s place we put the mid-century buffet that used to be in the dining room. I’ll update you on the dining room in another post. So, with the furniture playing musical chairs it finally motivated me to get something on the wall. 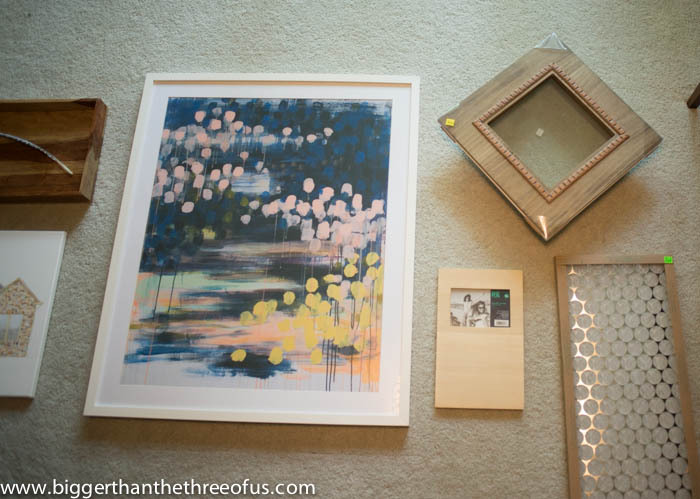 First thing I did was to raid all the closets in the house for picture frames and framed art. I laid all of them out on the floor (minus the one’s that I didn’t want for sure) and loosely arranged them. 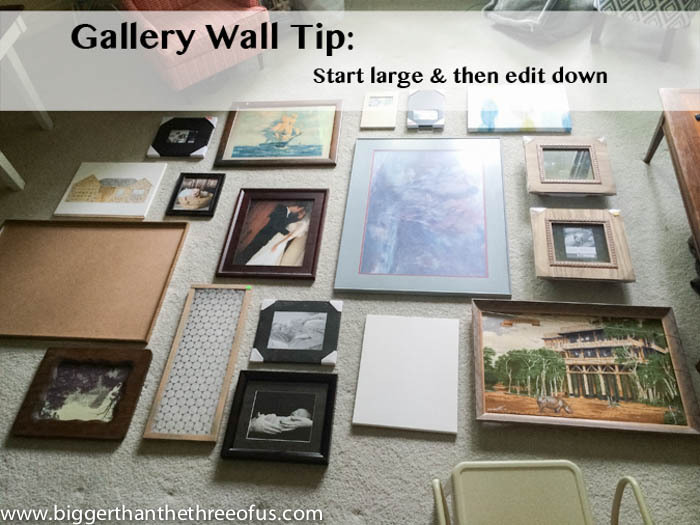 From that point, I measured how big my gallery wall was and knew that I had to pair it down. I find it easier to pair down than to add more. I laid out my gallery how I liked on the floor and then I started with my largest, prettiest, most-prominent piece first. I loosely measured the distance between pieces on the floor and then transferred them to the wall. I’m ok with eye-balling, so this way definitely seemed to work best. Back in March, I found these at Goodwill. I may have bought five (yep, that was definitely over-kill), but at .49 a piece they were a steal! Originally, I thought that placing them together somehow and creating a frame around them would be cool. I tried that concept but never felt like I had the right space or idea to pull it off. 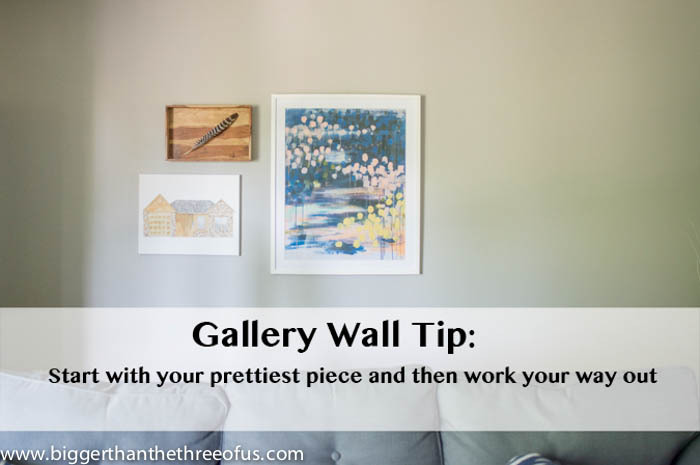 While working on the gallery wall, I decided to hang one up in the middle of it. It totally worked by itself and I was even digging the brown trim, but the brown trim didn’t work with the other pieces around it. 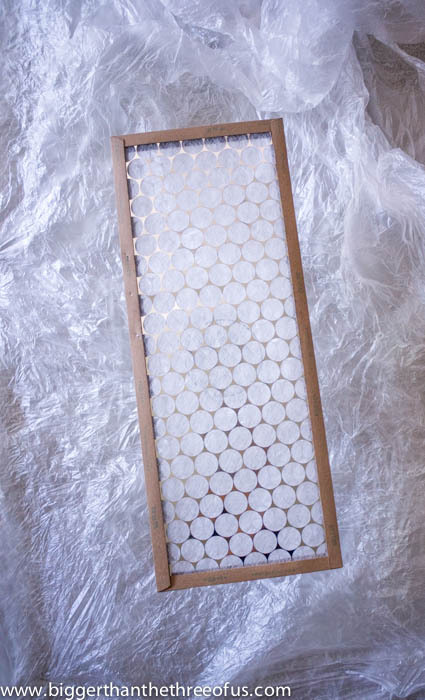 I laid the air filter on some plastic and grabbed an old sample jar of white paint from the garage. With a small paint brush, I covered the brown with white. It took about five minutes and was free. Now, I really doubt that you have an air filter to transform, but I won’t judge if you do. lol. 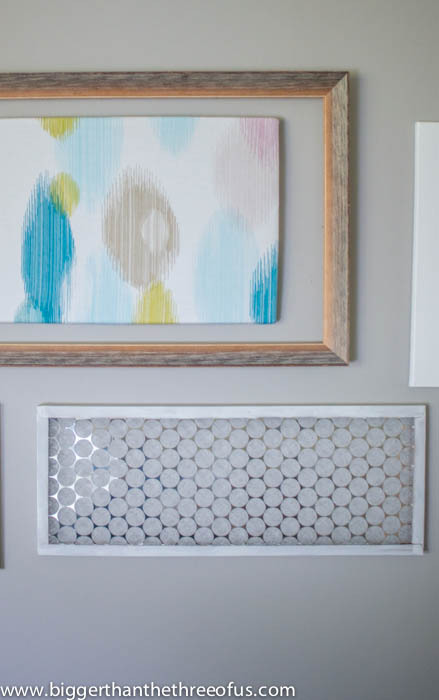 But seriously, what can you give a little bit of leftover paint to and be able to reuse? 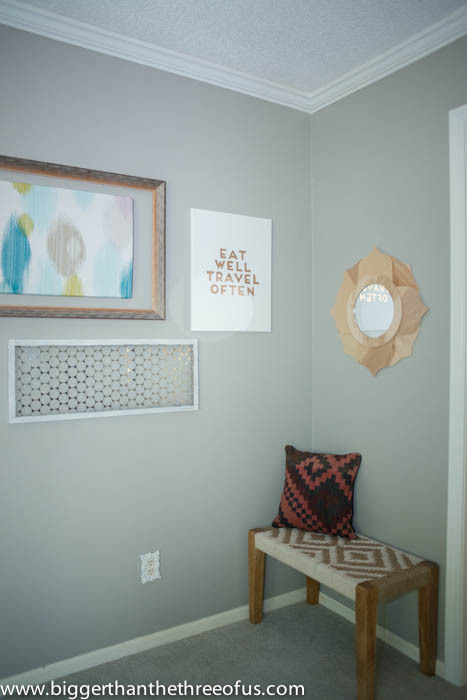 The “Eat Well Travel Often” is a recent DIY. The flower print is an old Ikea purchase. 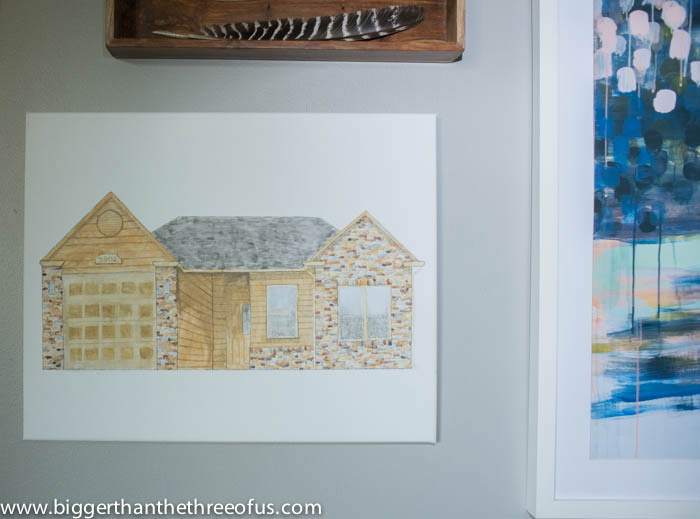 The house painting is a DIY by Luke. He gave it to me for Christmas and I just adore it! It’s our first house in Columbia, MO. The wood tray is thrifted and the feather is courtesy of our backyard. 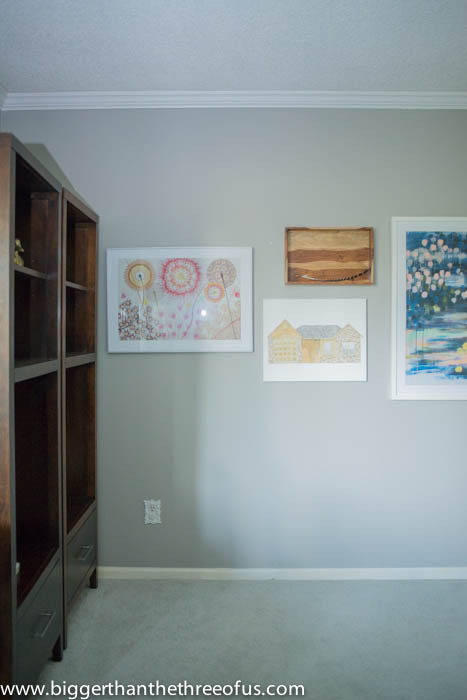 The middle painting is by Caroline Wright, which we purchased off of One Kings Lane. 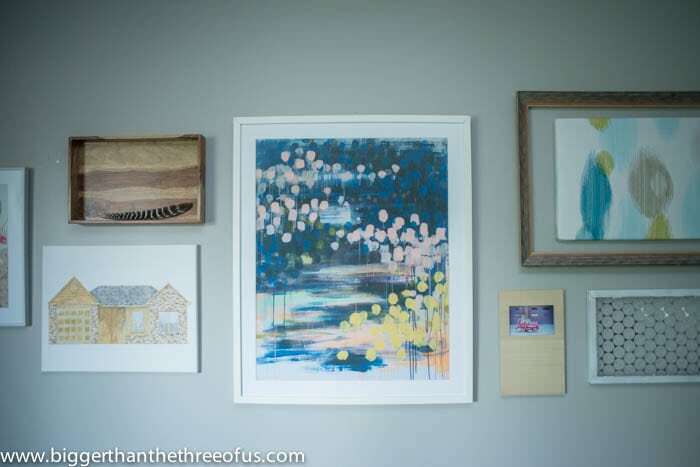 The DIY Anthropologie Inspired Lotus mirror rounds off the corner of the gallery wall. I’m finally a bit excited about where our living room is going. I’ll be sharing more of it soon.